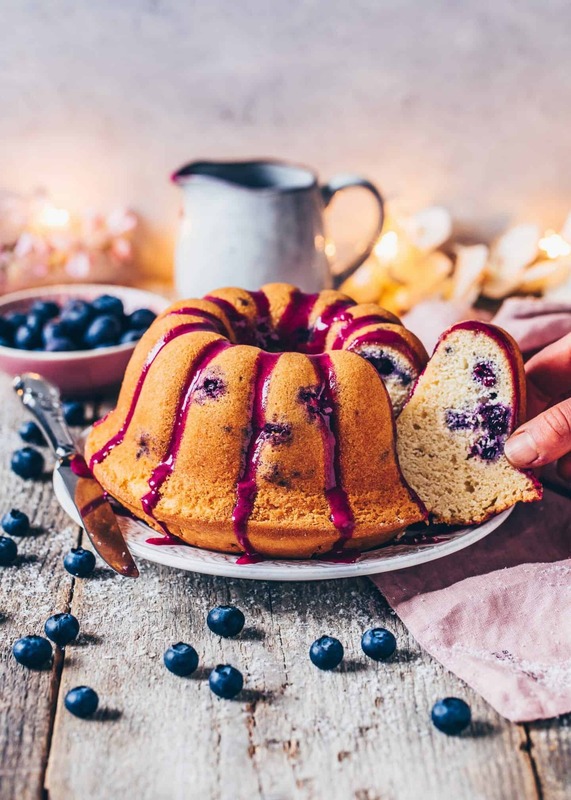 This Blueberry Bundt Cake is a fluffy vegan lemon cake with blueberries and a natural blueberry glaze! This recipe is quick and easy and makes the perfect simple dessert for any tea or coffee party! I love making recipes like this. Recipes that come together quickly and are perfect for un-planned tea and coffee parties. 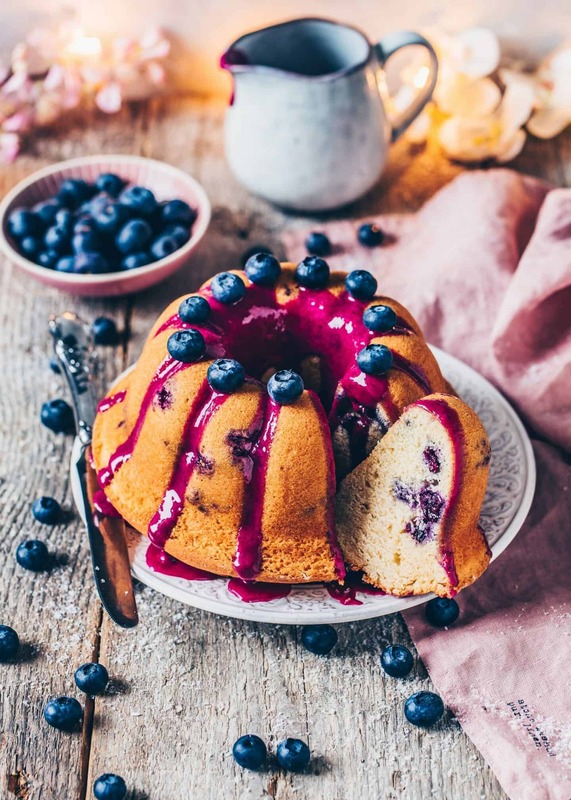 Furthermore, this Blueberry Bundt Cake is perfect for any occasion where you may find yourself craving something sweet. It’s the perfect addition to your daily cup of tea or coffee, or just to bring with you on a picnic. I hope spring will start soon because I can’t wait to enjoy this light and fresh vegan lemon cake while sitting in the sun and listening to the birds. Do you miss the feeling of summer too? If so, this cake will definitely brighten up your day! When I was a child I made simple fluffy lemon or chocolate cakes very often, because they’re truly so quick and easy to make, actually, it was one of the first cake recipes I learned to bake myself. 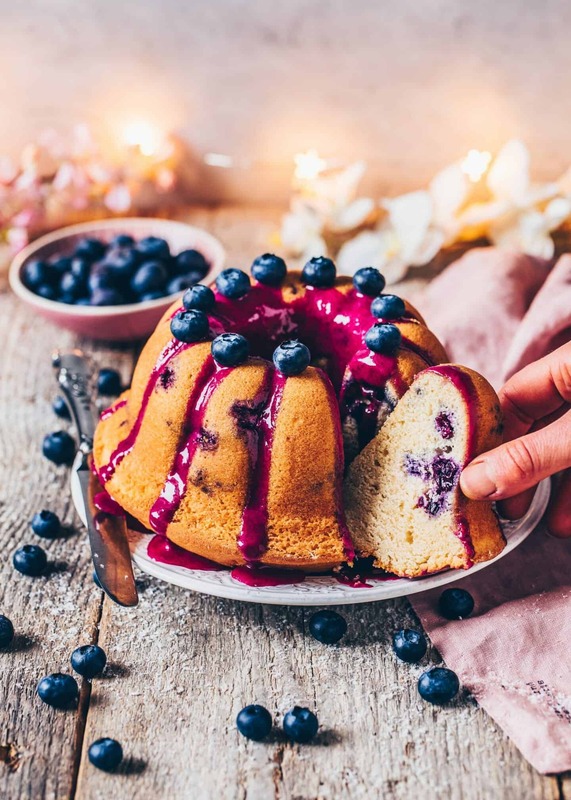 This beautiful Vegan Blueberry Bundt Cake is a vegan makeover of the traditional classic lemon cake recipe we used to make at home. In fact, it’s also adapted from my fluffy Vegan Vanilla Cake which I shared a little while ago. I just changed a couple of things and added more lemon flavour plus blueberries. 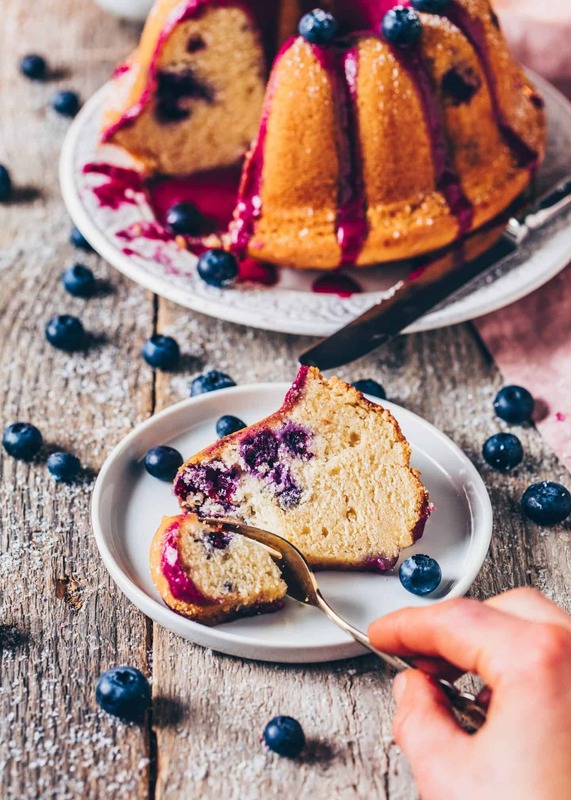 This blueberry vegan lemon cake is actually very delicious on it’s own without any kind of frosting. You can just dust it with powdered sugar, however, personally, I like making a sweet and simple blueberry glaze. I used to call it “magic glaze” because I‘m so impressed with its amazing purple color! And of course, the colour is completely natural! 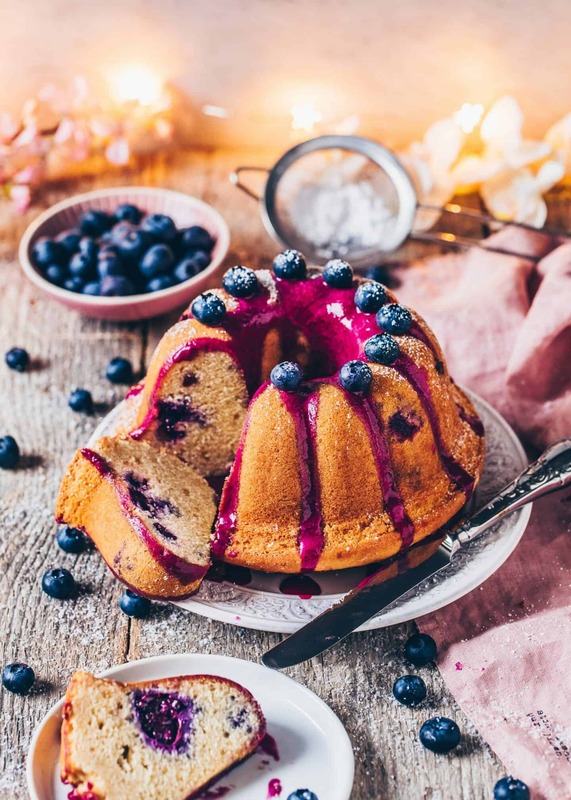 The blueberry glaze is made with only blueberry juice, powdered sugar and a little bit of lemon juice. 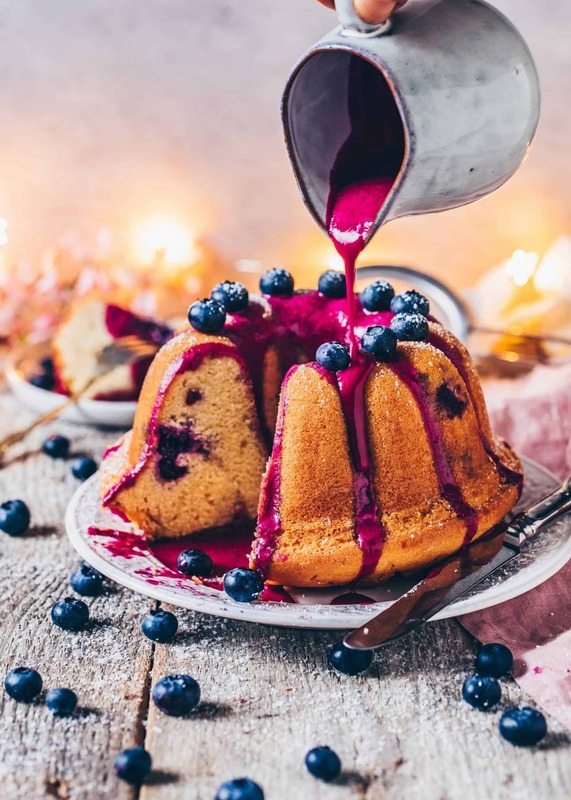 Simply blend all the ingredients together and you’ll get a thick, smooth and sweet glaze which is perfect to put on top of cakes, waffles, pancakes, crêpes and more. 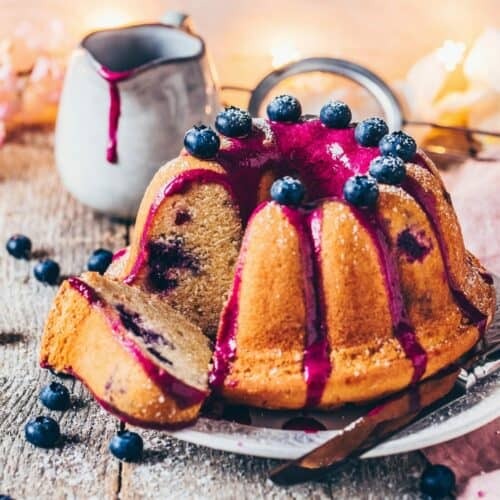 You can enjoy this Blueberry Bundt Cake in any season, because you can also use frozen blueberries instead of fresh blueberries. Luckily, here in Germany blueberries are available all year round, so this doesn’t stop me from baking with blueberries. In case you’re using frozen blueberries, remember that it’s not necessary to thaw them. Just simply toss with some starch or flour, but please do not add lemon juice or other liquids to the blueberries, try to keep them dry. Also, make sure not to add too many blueberries into the batter or they’ll start to weigh the cake down. 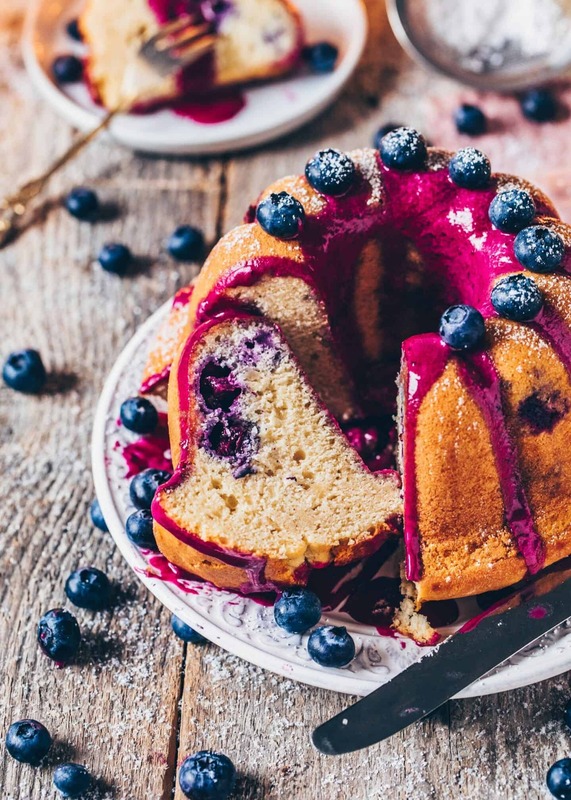 To be honest, I’ve always had a little trouble getting a cake out of a bundt pan in the past. I still remember finding myself having more butter on my fingers than on my pan when greasing it. Since then, I’ve found that a light coating of melted butter using a brush and then dusting with flour worked the best. Another important tip, do not let your cake cool completely in the pan, because the butter will harden when cooled, so you will probably not get the cake out easily. I recommend letting the cake cool for about 10-15 minutes after you’ve removed it from the oven. Then invert it onto a wire cooling rack and let it cool for another 5-10 minutes. Now you should be able to pretty easily and cleanly remove the pan. The Best Vegan Lemon Cake Recipe! 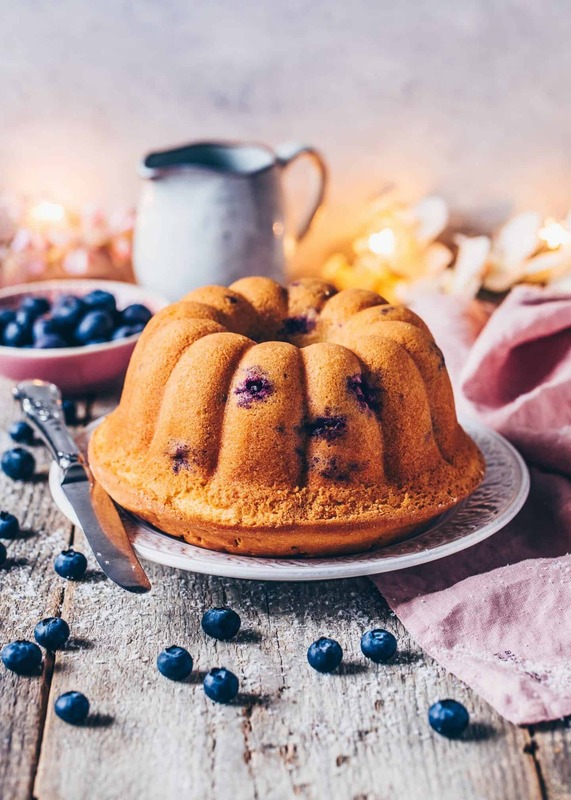 Because so many of you have asked if you can make some of my cake recipes in other pans, such as a muffin, cupcake or loaf pan, you will be be happy to know that this vegan lemon cake is one of those versatile recipes! 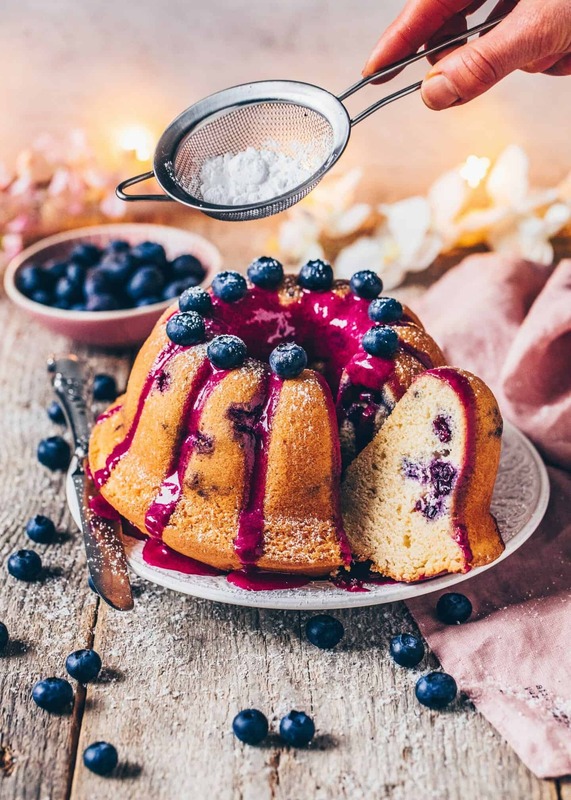 You can also bake it in a round pan to make a simple sponge cake or layer cake, or bake it in a loaf pan, or in cupcake and muffin pans. Please always make sure to check the baking time, because smaller cakes are cooked faster than larger sized cakes. For vegan lemon cake cupcakes or muffins, it only takes about 15-20 minutes. 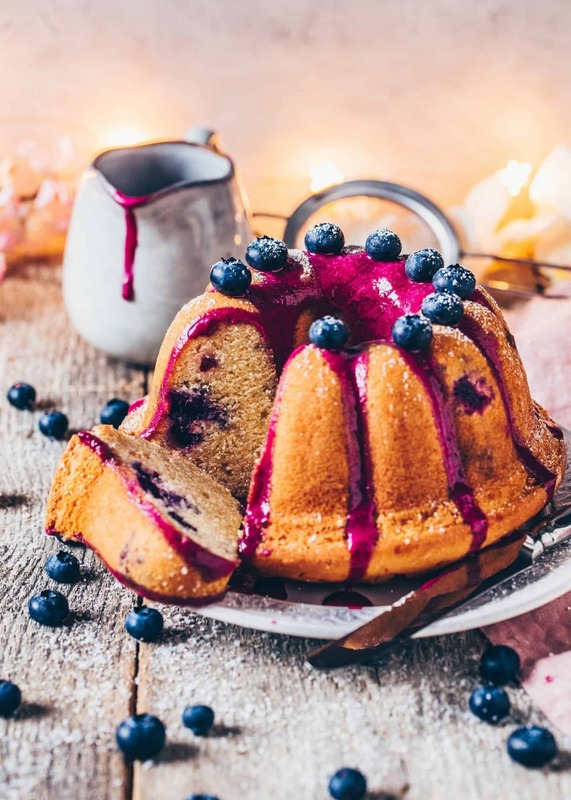 A round cake or loaf, however, takes about the same time as in a bundt pan. I always recommend that you do a cake test during baking so that you can check if the cake is done. To check it, simply insert a cake tester (f. ex. a large tooth pick) into the middle of the cake. When it comes out almost clean, you can remove the cake from the oven. Make a note, that baking for too long is not good either because the cake becomes dry. 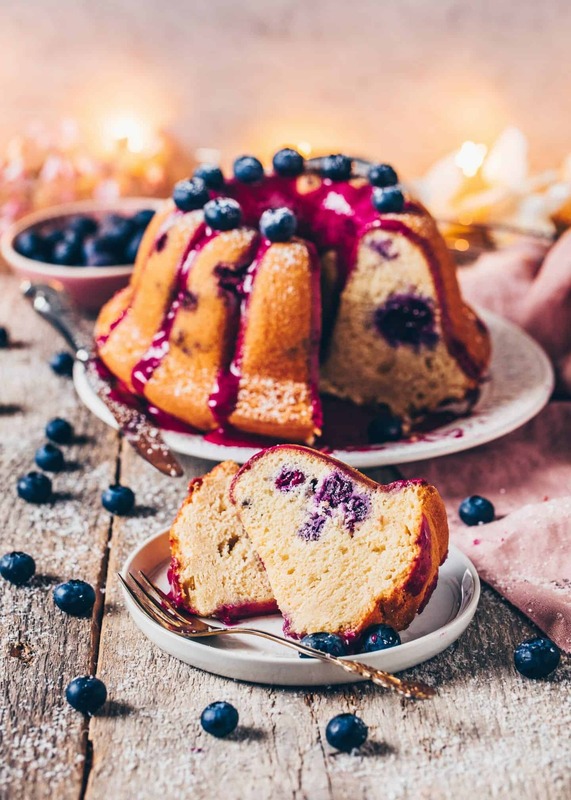 If you are looking for more easy cake ideas, be sure to try my Best Vegan Chocolate Cake, fluffy Vegan Vanilla Cake, Vegan Black Forest Cake, Blueberry Crumble Cake or one of my fruity and creamy Vegan Cheesecake Recipes. Brush a small 6 cup (18 cm) bundt pan with melted butter, then dust with flour. Squeeze a lemon into a measuring jar, then add soy yogurt and dairy-free milk (it should be approx. 240 ml total amount of liquid). Mix to combine and set aside so it curdles and becomes vegan buttermilk. Sift the flour and cornstarch into a large bowl. Add baking powder, baking soda and salt and mix everything together. In another bowl, cream margarine with sugar, vanilla extract and lemon zest using an electric hand mixer. Stop the mixer to scrape the sides using a spatula to combine all the ingredients. On low speed, mix in 1/2 of the flour mixture. Scrape down the sides of the bowl to incorporate. Add in the buttermilk and beat on low speed until incorporated followed by the remaining flour mixture (but please make sure not to overmix). 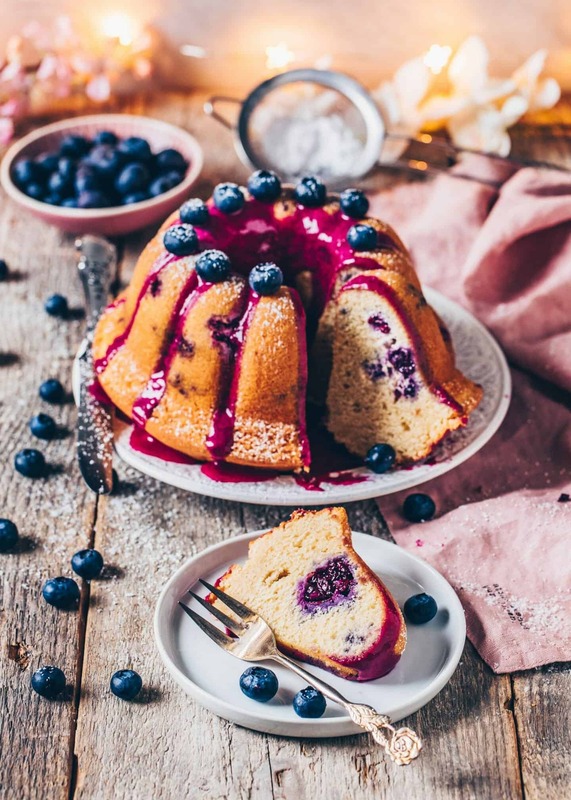 Gently fold the blueberries into the batter and pour it into the prepared pan. (Please read the information in the text above, if using frozen blueberries). Bake for 50-60 minutes, or until a toothpick inserted into the middle of the cake comes out almost clean. Allow to cool for 10-15 minutes in the pan, then invert it onto a wire cooling rack to cool further 5-10 minutes. Remove the pan carefully and let cool completely. Cook down blueberries in a pot for about 2-3 minutes. Add a little bit of water to avoid burning, stirring occasionally. When the blueberries are soft, strain through a sieve and collect the juice. 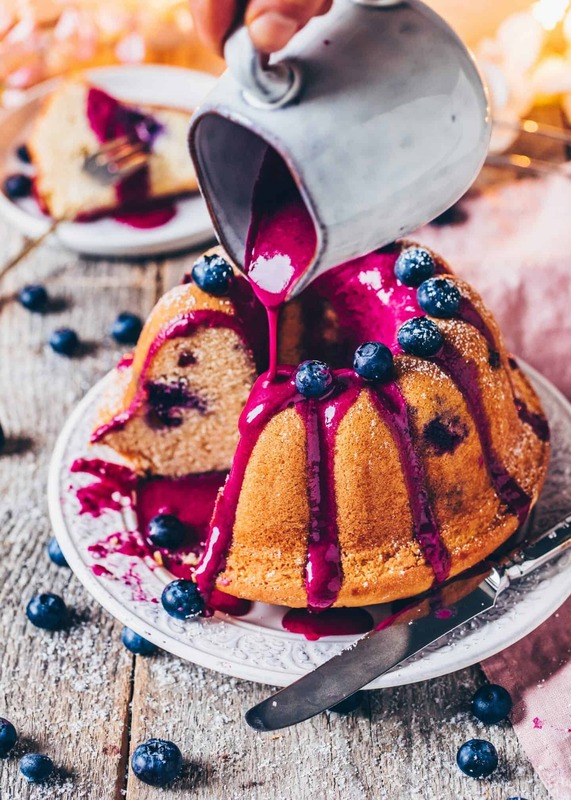 Put icing sugar, 3 tablespoons of the blueberry juice and lemon juice into a mixing bowl and mix using an electric hand mixer until smooth (or mix in a blender). Please add only enough blueberry juice or icing sugar as necessary until desired consistency. It should be thick but pourable. Pour the glaze onto the cooled cake evenly. Refrigerate the cake for 10 minutes to allow the glaze set. 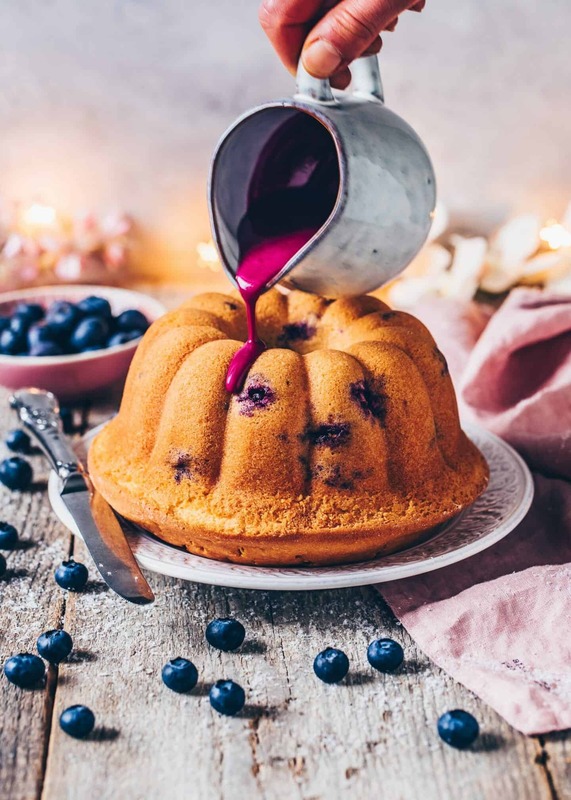 I recommend you to make the blueberry juice for the glaze yourself because store-bought blueberry juice will probably not create such an amazing color. Covering the cake with a piece of aluminum foil or parchment paper during baking stops it from browning too much on top. Take a note that it will probably make the baking time longer. This looks absolutely amazing! I’m a huge blueberry fan so I’ll definitely try it. I just need to find a bundt pan and I’m good to go! Thank you! Have fun trying this recipe! Made this cake and it was easy and delicious! 1 cup of flour is 125 grams, so you need 2 cups. You can sift the cornstarch along with the flour into the bowl or add it along with baking powder.